With the first testimony of new Fed Chair Janet Yellen completed and with an agreement over the debt ceiling already reached, equity prices extended higher last week despite many overbought conditions being observed. Still, higher levels are possible before running up against major trend line resistance. One such case is the NASDAQ Composite Index (IXIC), which ended the week at 4,244 following seven consecutive daily gains. 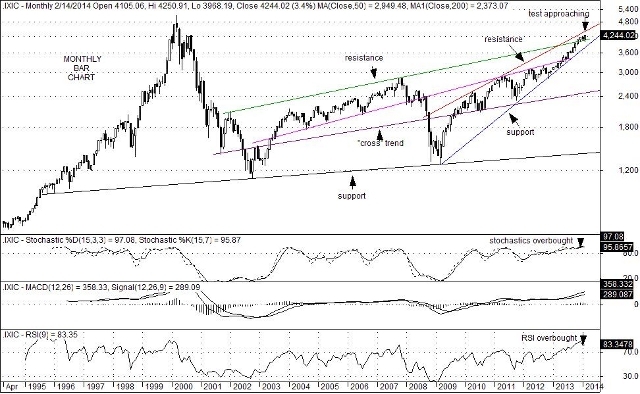 Technically, monthly stochastic oscillators and the current reading of the monthly Relative Strength Index (RSI) are at rarefied levels, as is the index itself. That said, major trend line resistance currently sits at 4,505, which is 3.8% higher than the close of Friday. Another factor to consider, is that the afore mentioned trend line is upward sloping which suggests that the exact resistance level will also rise as time goes by. Nevertheless, a reading above 97 on monthly stochastic studies is a feat not often reached. In addition, the last time monthly RSI reached the 83-to-87 range (where it has been sitting since December 31, 2013) was between December 31, 1999 and February 29, 2000. Such a condition suggests that profit-taking, or at the very least a hedging strategy (using options perhaps) might be in order given the current technical set-up. This entry was posted on Thursday, February 20th, 2014 at 11:34 am	and is filed under NASDAQ Composite Index (IXIC). You can follow any responses to this entry through the RSS 2.0 feed. You can leave a response, or trackback from your own site.